What caching issues and babysteps you are talking about? Answered a few posts above yours. Hi, I do not have experience with this programming language. But is there anything I can do? I have a 80d. I post just to thank emkap efforts and a1ex support. As the author of the original post, I am following all your steps. As I cannot help in this phase of development, I am not posting often here. I don't want to make the impression that I am trying to put preassure over developers. Thanks again I hope you could get it working. Just a heads up - QEMU is updated often with DIGIC 6 stuff. For example, latest update is able to track direct jumps to functions, which are used all over the place in Thumb-2 code. By the look of minimal.c from unified branch I guess that to print "Hello, World!" 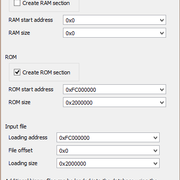 in QEMU we need few more stubs (like bmp_vram_info, LCD_Palette) - am I right? The display backend changed significantly on DIGIC 6 - look it up on CHDK. I'm not sure of the pixel format used outside bootloader - first we need to run something on the camera alongside the main firmware (e.g. LED blinking). Then we need to figure out how to print things on the screen; it will be probably similar to CHDK, but I'm not sure yet. Only after doing this step we can see whether we need bmp_vram_info and LCD_Palette, or maybe some replacement. 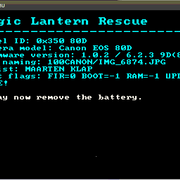 The CanonGothic string is not present in the 80D ROM. No big deal - Canon fonts are not used in many places in our code. BTW, the pixel format used in the bootloader is 8 BPP, palette-based; the palette is specified as YUV, but the U/V components are unsigned now (they were signed on previous cameras). See QEMU source and disp_direct.c on the recovery branch. Ok. Is it possible to test cache-related issues in QEMU? Or is it safe enough to test on real camera? QEMU does not emulate cache behavior, other than a few status registers. It's probably safe to perform these tests on the camera. However, at this point, you'll need some help from us to sign the binaries you want to run (currently the binaries can be run either as autoexec.bin or as FIR; the former needs a boot flag set in the ROM and the latter must be signed). To my knowledge, CHDK had trouble running the Canon firmware from a firmware update on most (if not all) digic 6 models, so we might have to enable the boot flag from the bootloader context, in order to run autoexec.bin. 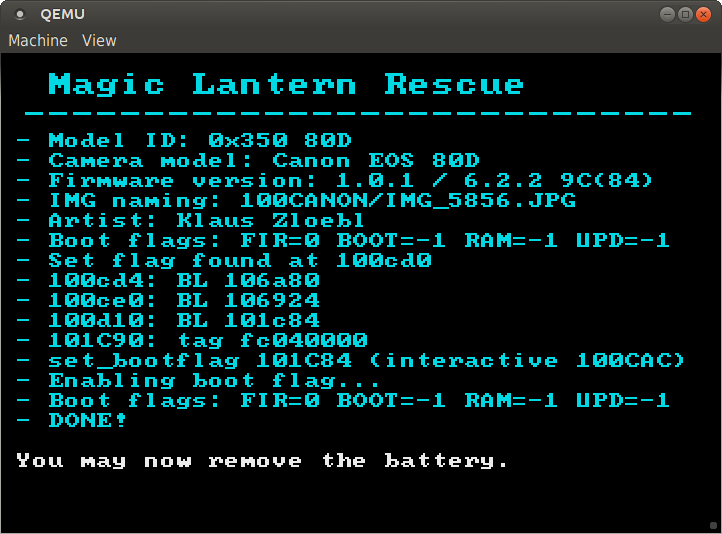 Traditionally, we enable the boot flag from main firmware, but we did enable it from bootloader on VxWorks models. It's probably best to try on a less expensive D6 model first; if anyone is willing to take the risk, I can prepare a FIR for enabling the boot flag in this way. Having some other ARMv7 device to test things could be helpful, too. Cheapest option for Digic 6 today (Powershot derivates excluded): 750D, used. Listed at about 415 Euro (Germany). Are these settings correct? I know thah I have to change base architecture to ARMv7-A&R and uncheck both "delete instruction with no xfrefs" and "perform no-return analysis". 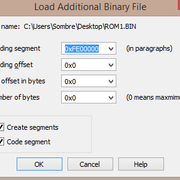 FE0A0000 is where you will find the main firmware after loading the ROM. The initialization code starts at FC000008, and the bootloader (LILO-style, prints "BootLoder" on the UART char by char) starts at FE020000. To start the main firmware, the bootloader writes 0 to 0xD20C0084, then jumps to FE0A0000. There are a few additional blobs copied from ROM to RAM; you can get them from QEMU if you run it with "-d romcpy" (or just look them up in the QEMU test suite log). Sorry for these basic questions, but I was basing on info from this post. Anyway, this is how should I load files - am I correct? Looks mostly fine. In the second box, try Loading segment 0, Loading offset 0xFE000000, and (not sure if this is needed with latest versions) number of bytes 0x1FFFFFC. ROM:FC2DB94E ADR R0, aSystemMemoryIn ; "System Memory Information\n"
ROM:FC2DB956 ADR R0, aStartAddress0x ; " Start Address = 0x%08lx\n"
ROM:FC2DB95E ADR R0, aEndAddress0x08 ; " End Address = 0x%08lx\n"
ROM:FC2DB966 ADR R0, aTotalSize0x08x ; " Total Size = 0x%08x (%9d)\n"
ROM:FC2DB970 ADR R0, aAllocatedSize0 ; " Allocated Size = 0x%08x (%9d)\n"
ROM:FC2DB97A ADR R0, aAllocatedPeak0 ; " Allocated Peak = 0x%08x (%9d)\n"
ROM:FC2DB984 ADR R0, aAllocatedCount ; " Allocated Count = 0x%08x (%9d)\n"
ROM:FC2DB98E ADR R0, aFreeSize0x08x9 ; " Free Size = 0x%08x (%9d)\n"
ROM:FC2DB998 ADR R0, aFreeBlockMaxSi ; " Free Block Max Size = 0x%08x (%9d)\n"
ROM:FC2DB9A2 ADR R0, aFreeBlockCount ; " Free Block Count = 0x%08x (%9d)\n"
seg001:FE2DB963 DCB 0xF9 ; ¨I suppose it's because it wasn't analyzed though I'm not sure why. new here, too! Just ordered a 80d and i'll be happy to help wherever I can. I have some programming knowledge but mainly perl... I'll try and get myself up to speed and in the meantime follow your progress! As we did not have a ROM dump for that model (5DS), the boot flag enabling code was written to be portable (so it could work on an unknown model, likely similar to what we knew). Before running this code on 5DS, we have tested it in QEMU on 80D, 760D and 750D, and also visually checked it for 7D2 - where we only have an incomplete ROM dump (blinked, but with errors). The above will run in dummy mode; it will only print what it's going to do. If the screenshot looks alright, I'll upload a FIR that will modify your camera. Source: recovery branch (with the set_bootflag call commented out). Does the previous FIR from this thread (the ROM dumper) work for you? There is a color palette issue (it won't show the same color every time - probably the same caching issue described earlier).